Terri!!! Your shrine is absolutely amazing!!! LOVE too much!! That´s all I can say!! Terri, your shrine is gorgeous!! I love the beautiful papers at the top and bottom, and your embellishments are absolutely beautiful! Love it! Terri that sounds like a fabulous book that I need to get. I have often wanted to create a shrine for Mary and you have given me a push to get going on creating something meaningful. 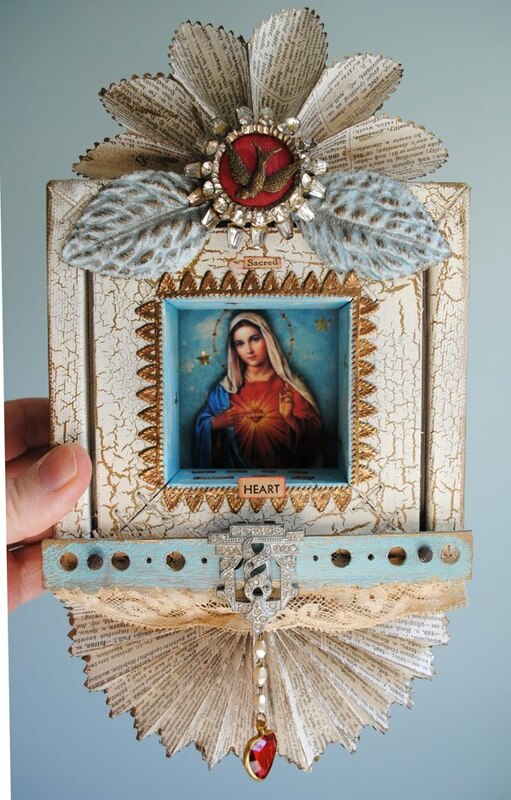 Your beautiful mixed media piece is just gorgeous! thanks for stoping by my blog as it alerted me to the fact you had taken part.. I wouldnt have liked to miss this. Terri, your shrine is absolutely beautiful. The details are perfect. Wonderful shrine. Now I have to go find the book!!! This is a REALLY gorgeous and special piece. One of my favorites for sure! It is just perfect. Thanks for sharing with all of us and keep up the beautiful work. Teri I just LOVE LOVE LOVE this!! It seems that you have stepped out of your comfort zone (Marie) and this is just AWESOME. One of my favorties. With words like that "The fore at the bottom of my heart" I am already moved to the core. gorgeous classical shrine...but the work you have put into it is incredible. Ty for sharing it with us! your shrine is just gorgeous ... love it all! This is just amuzingly beautiful I love it!!! Hi Terri..absolutely stunning and gorgeous! Wonderful and magnificent piece! Beautiful job Terri...so much wonderful detail...awesome. WOW, your shrine is awesome, perfectly balanced with all your elements! oh my how beautiful~ you are so gifted I love perusing your blog I always leave filled with inspiration. thank you so much for sharing that Terri.. 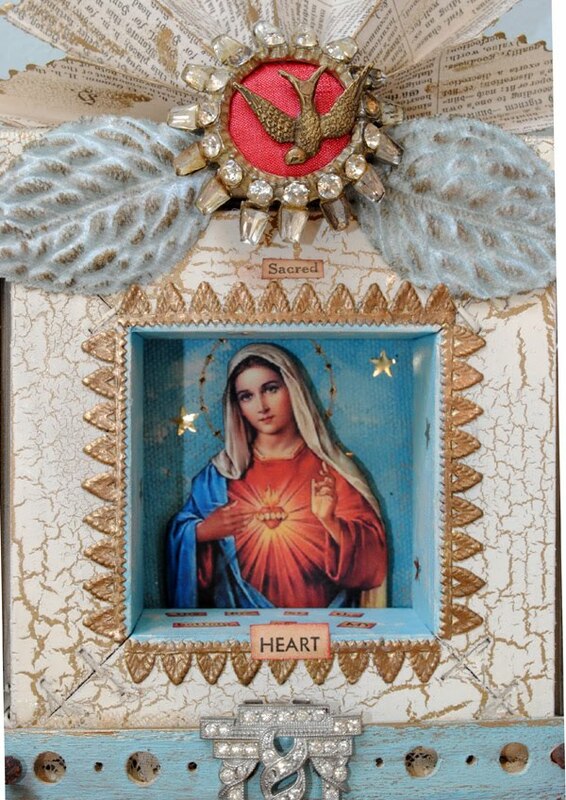 Thank you for sharing such a beautiful Sacred Heart Shrine. Will you be sharing a tutorial on how you made this piece. She is speaking to me during my time of turmoil. Hi Terry! 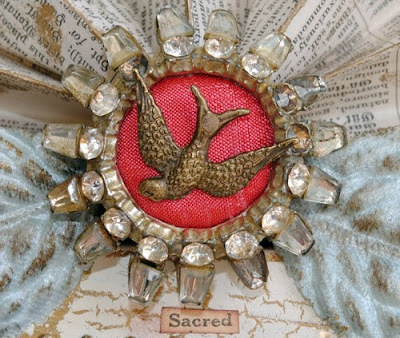 I just found your beautiful blog, and I am enchanted. I love making little pretties, and I am finding your creations so inspiring. I have decided to follow along! Stunning Terri. It is the definition of a gorgeous shrine. I am chiming in late for the shrine challenge. 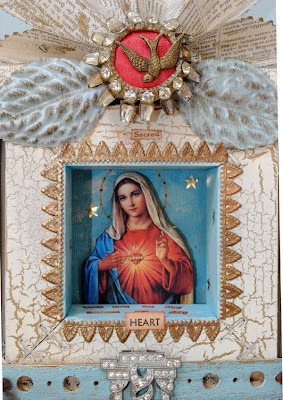 Your Sacred Heart shrine is amazing and inspiring in every detail... I Love SMKidd, must check out that book! Hi Terri, thanks for visiting my blog! We are like sister bloggers:) I love your mixed media art! This is so beautiful and unique! I can't wait to explore your lovely blog more and see all of your video tutorials.